As a response to the growing number of New Yorkers living with HIV/AIDS, founding Executive Director Kenneth Wampler and a dedicated Board of Directors established The Alpha Workshops in 1995. 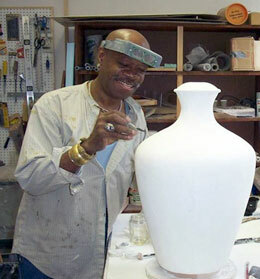 Modeled on the early twentieth century English Omega Workshops and the American Arts and Crafts movement among others, The Alpha Workshops is the nation’s only non-profit decorative arts studio that trains people with HIV/AIDS or other disabilities/vulnerabilities and offers employment in a supportive environment. The former owner of a boutique decorative painting practice, Wampler spent the 1980s and early 1990s working with the AIDS Resource Center – now Bailey House – building supportive housing for homeless people living with HIV/AIDS. He eventually conceptualized The Alpha Workshops as an innovative approach to unifying the disparate spheres of decorative arts, supportive employment, and HIV/AIDS under one progressive mission. Since its inception, The Alpha Workshops has evolved into a fully-licensed vocational training school and elite decorative arts studio. Year after year, the AW has continued to expand its constituencies, funding base, and design client list, as well as increase the breadth and professionalism of its decorative arts training programs. As the AW embraces new opportunities and challenges, the organization maintains a deep and lasting commitment to the HIV+ and LGBTQ communities, as well as the community of individuals with disabilities or other vulnerabilities in New York City and beyond. Since its first editorial in Interior Design magazine in 1997, The Alpha Workshops has received press coverage in Architectural Digest, Connecticut Cottages & Gardens, Contract, Domino,ELLE DECOR,House & Garden, House Beautiful, InStyle Home, Interior Design, Metropolis,Metropolitan Home,Metrosource, Newsday, Newsweek, New York Magazine, New York Spaces, O at Home, POZ, The Daily News, The New York Times, The Robb Report, Time Out,Traditional Home, Veranda, and Vogue Living. In 1998, POLLACK introduced a line of fabrics based on designs Alpha’s designs. Sales over the next decade generated more than $100,000 in revenue. In 2008, POLLACK launched a second collection of Alpha designs. The Alpha Workshops has also licensed its designs to Koroseal (vinyl wallcoverings), Thibaut (printed wallcoverings), Artaissance/Larson-Juhl (print-on-demand artwork), and Edward Fields (rugs). 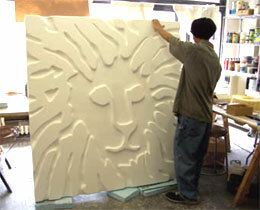 In 1999, the Alpha Workshops create 4 large murals for Clearview Cinemas. Since then, Alpha has completed many corporate commissions and installations including work for: Benjamin Moore, Anne Klein, Lifetime TV, WebMD, New York School of Interior Design, Takashimaya, and the Mandarin Oriental Hotel in Las Vegas. 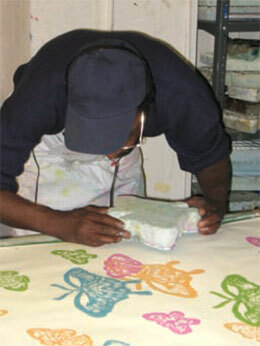 In 2001, the Alpha Workshops introduced Painted Papers, a line of hand-painted wallpapers. The Texture Collection, a second line, followed in 2008. In 2002, the Cooper-Hewitt National Design Museum selected two designs from Painted Papers (Infinity and Sunflower) for its permanent collection. Astral, a design from The Texture Collection, was awarded Interior Design magazine’s Best of Year award for Wallcovering: Paper! in 2013. Since 2002, funding from New York State’s Adult Career and Continuing Educational Services – Vocational Rehabilitation (ACCES-VR, formerly VESID) has helped support Alpha’s decorative arts training programs. In 2002, seeking to expand product lines and possibilities for job creation, Alpha launched its first hand-cast lamp, the Eden Roc Lamp, created by staff artisan, Obediah Fisher. Since then, the Eden Roc lamp has become a signature piece from The Alpha Workshops. 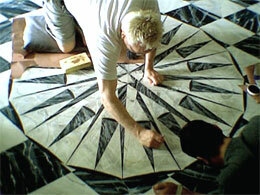 In 2002, as part of the restoration of Gracie Mansion, the official residence of the Mayor of New York City, Alpha recreated a historically accurate faux marble floor in the house’s grand entryway. In 2005, Alpha completed an intensive restoration process for the ballroom of the Prince George Hotel that involved mold making, casting, and decorative painting. The project received a 2006 Lucy G. Moses Preservation Award from the New York Landmarks Conservancy. In 2006, the New York State Education Department awarded Alpha a license to practice as a private vocational school. First working with Samuel Botero on an eastside townhouse in 1996, Alpha’s residential portfolio features collaborations with many top-tier designers, among them: Jamie Drake, Celerie Kemble, Thom Filicia, Kelly Wearstler, Steven Gambrel, Albert Hadley, and Matthew Patrick Smyth. The Kips Bay Decorator Showhouse, the Greenwich Showhouse, the Showtime Showhouse, the Designer Visions Showhouse, and the Hamptons Showhouse have regularly included Alpha’s products and decorative finishes. In 2011, Alpha received its first grant from the National Endowment for the Arts and its largest grant ever from the Gerda & Herman Lissner Foundation. Other grants have been received from Broadway Cares/Equity Fights AIDS, the Angelo Donghia Foundation, MAC AIDS Fund, American Express Foundation, New York Community Trust, The Richard J. Fasenmyer Foundation, the Jerome Robbins Foundation, Wells Fargo Foundation, NYC Department of Cultural Affairs and H.van Ameringen Foundation. Our leading corporate supporters have included: Benjamin Moore, Bloomberg, Con Edison, Koroseal, the New York Design Center, and Tiffany & Co. In 2013, Executive Director Kenneth Wampler was inducted into Interior Design magazine’s Hall of Fame with a special Leadership Award. 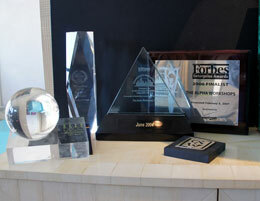 In 2010, the IFDA (International Furnishings and Design Association) presented Alpha with its Circle of Excellence Award for special humanitarian efforts. Alpha has also received a 2008 Henry Chapin Self-Reliance Award, a 2006 Forbes Enterprise Award (Finalist), a 2004 Community Hall of Fame Award from Thirteen/WNET for contributions to the community, and a 2002 ELLE DECO Design Award for Wallcoverings.